This seven pitch route combines sections of existing routes with four new pitches, creating one of the wildest chunks of free climbing on the Chief. The route has couple of blemishes. One short, savagely bouldery section (easy to aid), and the fact that the route ends at a hanging belay with no free-able link to the top of the wall. 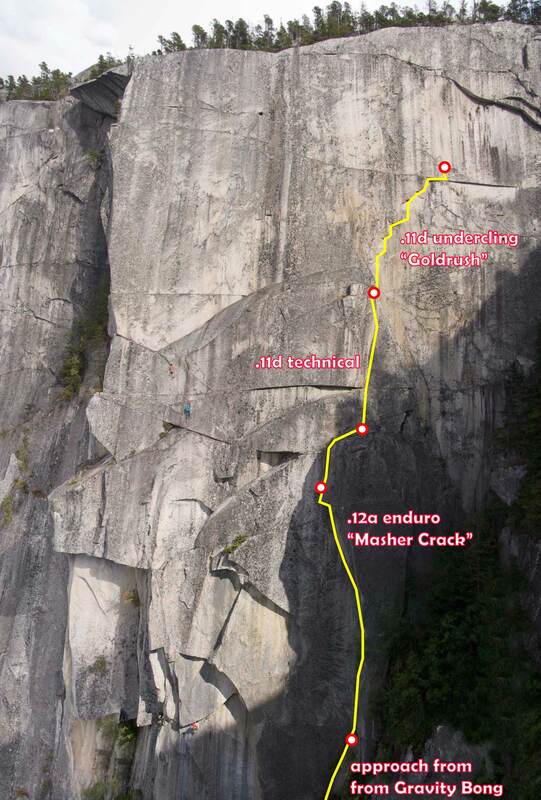 These are the only reasons that this route wouldn’t be in the running for the best free climb in Squamish. This route starts via the first two pitches of Gravity Bong before breaking out onto new terrain. Alternatively do four straightforward rappels from the rim to the base of the Masher Crack. The start of the climb utilizes the first two pitches of Gravity Bong. Climb akward right facing flare, until it is possible to traverse left and then up a right leaning crack. 5.10d. Up an easy ramp into chimney. Pull out of chimney into an excellent vertical corner, at the top of the corner make an exciting face climbing traverse right to the belay. 5.11c. Move right out of main corner and make a desperate finger traverse on tiny holds. Finish up easy ramp to an alcove belay below a stunning dihedral. 5.13-. The Masher Crack. Climb excellent, overhanging hands in the corner until forced into a layback. Layback the bolted, seven inch crack, finishing with underclinging around the edge of the roof that caps the corner. Very burly. 5.12a. A short pitch, continue to the top of the corner and set up a belay on top of the pinnacle. 5.10a. Make some commitiing moves to gain an elegant shallow corner. 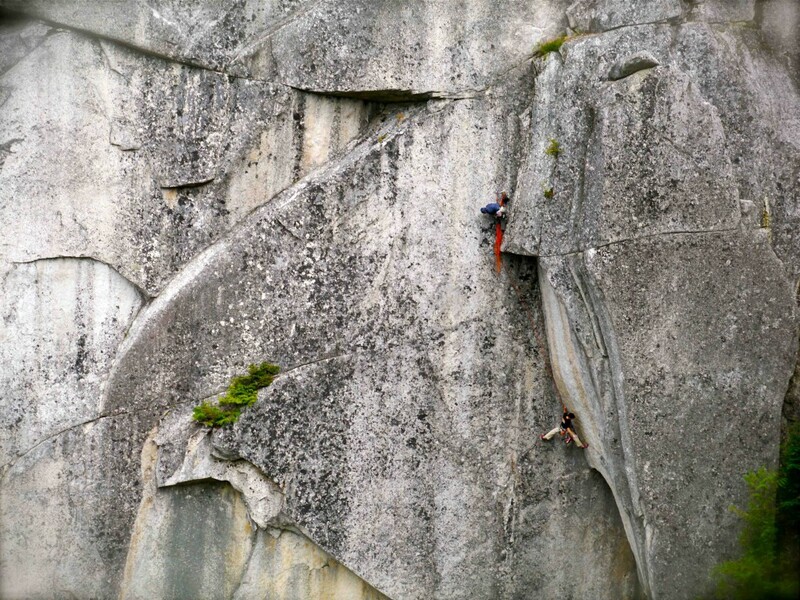 Technical and tipsy, this pitch utilises both the crack and the arete on perfect gold kissed granite. 5.11d. Goldrush. Climb the right facing “inverted staircase” corner system. Overhanging and exposed. Laybacking, hand jamming, and the occasional kneebar, wild moves in wild place. Fully bolted and simply amazing. 5.11d. Double set of cams to #3 BD 1 #4 BD. Nuts. Quickdraws. Photo topo. Climbing teams on Gravity Bong visible on left side of photo. Click to enlarge. From the anchor at the end of the last pitch a 35m rappel down slightly right gets you to a ledge, from here you can walk up and out of the South Gulley to join the backside trail.